Track progress with a single metric for each Blast. 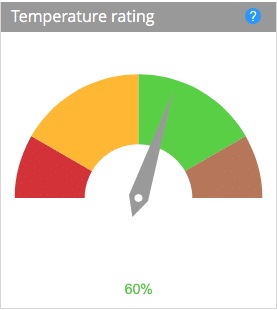 Customer Thermometer calculates (and updates in real time) a “Temperature rating” for each Blast. We then divide this total by the number of responses received. A temperature rating of 60% or above therefore means that your customers are universally satisfied. 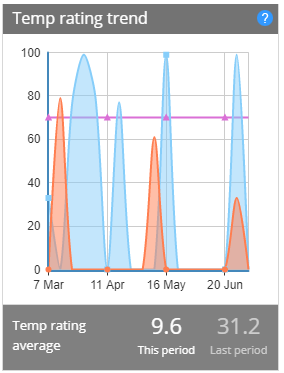 By tracking trends in Temperature rating over time, you can see whether your satisfaction levels across the board are improving, declining or staying the same, and take action. The same scoring principles apply to the main dashboard dial. The orange graph is the Temperature Rating across your account for each week. The blue line is the Temperature Rating for the previous corresponding period. The pink line is your Target, as set in the Targets area.